Officials at the Auschwitz-Birkenau museum launched ceremonies Wednesday marking the 65th anniversary of the Nazi death camp's liberation by laying flowers and candles near a wall by block 11 - where thousands of Poles were shot during World War II. The officials also paid tribute to the 231 Soviet soldiers who died fighting for the town and the camp, Polish Press Agency PAP reported. At the same time, education ministers and delegations from some 35 countries began a conference on education in Auschwitz that was part of the day of ceremonies at the former Nazi camp. 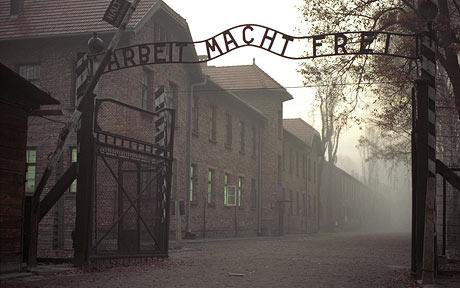 The ministers were set to discuss ways of teaching lessons about the Holocaust, DPA reported. Several dignitaries were set to speak in the afternoon, including Israeli Prime Minister Benjamin Netanyahu, Russian Education Minister Andrei Fursenko, as well as Polish President Lech Kaczynski and Prime Minister Donald Tusk. Some 150 former prisoners, along with some 200 members of the European Parliament and other assemblies, were expected to attend the ceremonies in southern Poland. After the main ceremony, Christian and Jewish officials were to pray together at a monument to the camp's victims. Some 1.1 million people, mostly Jews, were killed at the camp during the occupation of Poland in World War II.